Zion Market Research has published a new report titled “Digital Remittance Market by Remittance Type (Inward and Outward), by Remittance Channel (Banks, Money Transfer Operators, Online Platforms, and Others), and by End-User (Migrant Labor Workforce, Businesses, and Individual/Personal): Global Industry Perspective, Comprehensive Analysis, and Forecast, 2018–2025’’. 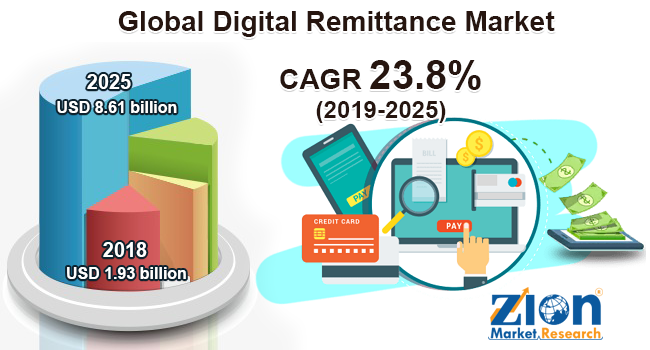 According to the report, the global digital remittance market was valued at around USD 1.93 billion in 2018 and is expected to reach approximately USD 8.61 billion by 2025, at a CAGR of slightly above 23.8% between 2019 and 2025. Digital remittance is interconnected with the banking systems in almost every country, where funds are securely transferred and received throughout the process. The process of money transferring overseas nearly cuts one half of the cost. The digital transactions can be done in less time regardless of the locations of the user and the receiver. In addition, the sender can choose a payment method from a range of payment processes and the receiver can have an option of choosing from a host of receiving methods as well. Increasing immigration rate from developing to developed nations in search of education and jobs is the major factor driving the global digital remittance market growth. In addition, the rising use of mobile devices that facilitates convenient, 24/7 trouble-free, and cost-effective money transfer are also expected to contribute notably toward the global digital remittance market growth. On the contrary, the security concerns and lack of awareness among the users may hamper the market growth. Nonetheless, the increasing mobile penetration and internet usage are estimated to open new growth opportunities for the global digital remittance market. The global digital remittance market is fragmented into remittance type, remittance channel, and end-user. Based on remittance type, the market is categorized into inward and outward. The inward remittance segment is expected to register a high CAGR in the future, owing to the increasing adoption of mobiles payment apps for fund transfer among the migrants in developed regions. By remittance channel, the market includes banks, money transfer operators, online platforms, and others. The money transfer operators segment is expected to hold a significant market share over the projected years, due to the rising adoption of mobile-based apps and mobile banking introduced by money transfer operators and financial institutions. In addition, strategic collaborations among the digital payment service providers and major banks are also expected to contribute toward the growth of this segment. For instance, in April 2018, InstaReM and DCB bank announced a strategic collaboration to provide digital remittance for their users. By end-user, the market includes migrant labor workforce, businesses, and individual/personal. The personal segment emerged as a dominant segment in 2018 and is expected to continue its dominance over the forecast time period as well. This can be attributed to a large number of fund transactions conducted by the immigrants that are working or studying overseas. By region, North America held the largest share of global digital remittance market in 2018, owing to the presence of major financial and communication service companies, such as Western Union (WU), MoneyGram, and Ria Financial Services. These companies have adopted the latest technologies to develop mobile apps that directly connect the customers across the globe with 24/7 activation. Europe is expected to witness constant growth in the global digital remittance market, as the region is a major automobile hub along with the increasing number of cross border business transactions resulting in high demand for digital remittance between the automobile players across the region. The Asia Pacific digital remittance market is slated to be the fastest growing over the forecast time period, owing to the rising mobile-based payment methods and high adoption of advanced technology, such as blockchain in banking and financial services. Some key participants of the global digital remittance market include InstaReM, Flywire, Western Union (WU), Ria Financial Outward Remittance, SingX Pte Ltd., WorldRemit Ltd., Remitly, Inc., Azimo Limited, TransferWise Ltd., Ripple, MoneyGram, and TNG Wallet.